It's Halloween week, and time for Alfred Hitchcock's Psycho! Discuss anything about the film that you want. Is this your first viewing, or have you seen it many times? Do you remember your first viewing experience? Post about it all here! Funny, I turned on the TV tonight to see what was on my "favorite" channels ... and Psycho was on one of them! I watched it for a minute or two, then I shut it off. I'll watch the whole thing in its time! 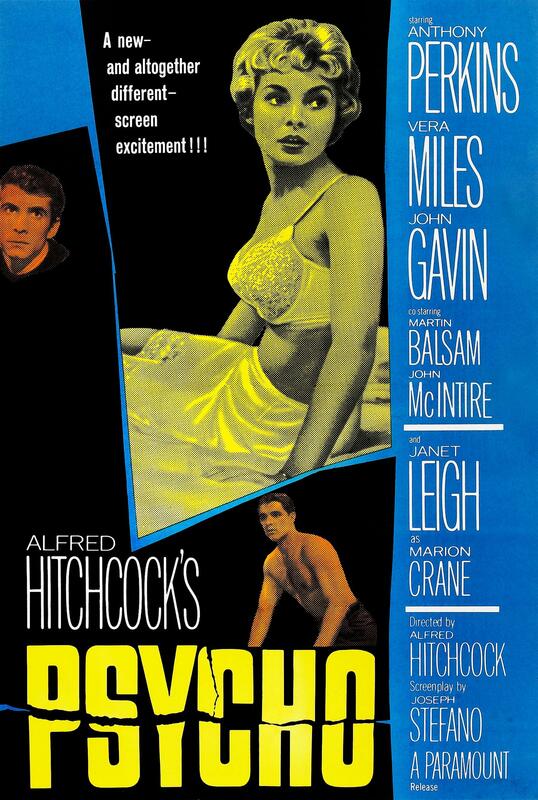 Meanwhile, inspired by one of the features on my Rebecca DVD ... anyone see any similarities between Rebecca and Psycho? For what I remember, in Rebecca there's a maid that is extremely hostile to the new wife. The maid is there all the time to making sure she doesn't forget Rebecca, like the man isn't allowed to have a new relationship. In Psycho, the gosth of Norman's mother don't allow him to have relationships with women. As Norman's mother is dead, Norman himself doesn't allow him to have relationships. They are stories about ghosts... it would be that the similarity, KC? That's it, Aline. The ghost of Rebecca, the first Mrs De Winter, haunts Manderley and everyone who enters there ... just as the ghost of "Mother" haunts Norman and the Bates Motel. I think I was around 10 years old or so the first time I watched Psycho. It was the first Hitchcock movie I'd ever seen as far as I remember. I was probably already aware of Alfred Hitchcock Presents though. I didn't know anything about the plot of Psycho, which made it wonderful to see for the first time. I'd never heard of the movie prior to just catching it one day on TV. It was probably on a Saturday, and I'd been sitting and watching a movie, and then Psycho came on afterwards. I remember I mentioned the movie to my parents and my dad knew the movie--he'd seen it years ago. I've been a Hitchcock fan ever since. Anthony Perkins is so great in this -- it's his little side glances, or tapping his fingers as he gets more and more anxious, or when he looks behind him to see if anyone's watching as Marion's car stops sinking into the lake for a few seconds and and then the slight smile as it starts to sink again -- it's a performance that is subtle, and chilling, and horrific all at once. How about those birds, huh? It's impossible to not compare that scene to other "horror" film. I'm guessing Hitchcock didn't like birds much. I remember watching this on AMC when I was just a teenager. My mom walked in and sat to watch some of it and reminisced about when she went to see this film upon its release. She said they had waited in a line that went around the block to see it. And she remembered how shocked everyone was that the star of the film dies -- and so soon into the film. And this goes back to what happened in Sabotage about how Hitchcock said it went against the rules to kill someone that the audience has grown attached to. He may have wanted to do the bomb scene differently in Sabotage, but there doesn't seem to be any hesitation to do away with Janet Leigh here! Now I vaguely remember watching a special on the making of Pyscho, and I seem to remember Hitch saying that they had photographed Janet Leigh and blown it up, and then filmed that for the closeup of her face after her death so that her eyes would look completely lifeless. This is a great film -- the scene at the end with the fly, and that smile... it stays with you. Yeah, you feel so much for Marion in this that the shower scene is always something I dread when I watch it. It's such a sad scene. She'd made a mistake and was now willing to do the right thing and face the consequences... and then it's too late. I read the novel many years ago (and also the two sequels), and the movie really is quite different in a number of ways. The focus from the start is on Norman. I think it was the screenwriter, Joseph Stafano, whose idea was to make the film's focus on Marion. It seems like I've heard that in a documentary about the making of the movie. The Norman in the book is also a middle-aged man, so he was made younger with Anthony Perkins playing him. Ever since that horrid shot for shot remake of Psycho came out around 20 years ago, I've always thought they would have been better off just re-adapting the book. I just watched this. I enjoyed this better than the other Hitchcock films that I've seen so far. The best part about it was the creepy music that played throughout, but especially during the opening credits. While I'd never seen this before, I totally knew very early on that Norman's Mom was dead. I suspected that he had gone crazy and was speaking as his Mom since you never saw his Mom or heard them speaking at the same time! I don't think there were too many films using this kind of a plot device pre-Psycho. So while we've come to expect these type of twists, I very much doubt too many audience members were able to guess that back in the day when it was released. This is still creepy after all these years. It's funny but today watching this and I found the murder of Arbogast more confronting than of Marion. And the way he fell down the steps was totally weird. It was cool seeing the camera angle watching him go backwards but it was like he stumbled back down every step, only collapsing at the floor. And what about just before that scene when he arrived back at the Motel a second time. He parks his car and slides across and gets out the passenger side, what's that about? Probably nothing but it seemed strange to me. This is Perkins role of a lifetime. His little twitches and again I mention a camera angle, the one at the motel desk and it's right under his neck. Just brilliant. I never saw the scene for scene remake but always thought, why would you remake it and not bring anything new to it? Seemed like a dumb idea to me. Anyone recognise the policeman who opens the door for the very last scene? He looked familiar but I had to look up IMDB to find out who it was.